Brand identity is a crucial part of marketing your business or organization effectively. 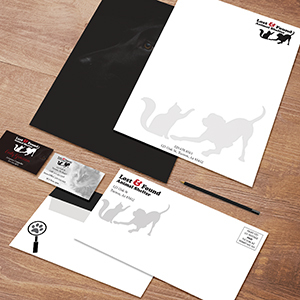 Our graphic design team will help you create a consistent logo for your letterhead, envelopes and business cards that will communicate the right tone and message to your potential and existing clients. The visual identity of your stationery should be carried through to your forms, brochures, pocket folders, direct mail campaigns, postcards, and any other printed materials. In addition to creating your company logo and fulfilling your stationery printing needs, we’ll provide you with a stationery template that allows different employees in multiple locations to customize their information without compromising the consistent brand identity that is so important for your organization. Let Spectrum provide you with a complete custom stationery package. We offer personalized notecards, notepads, envelopes and letterhead, and can help you create stationery that will grab your customers’ attention and present a positive and consistent brand image. Consider adding personal photos, foil stamping, embossing, or printing your stationery in full-color to add a distinctive touch. Preprinted stationery or “shells” are a staple of companies with multiple locations, companies that have the need for customizable business stationery, and companies that print financial statements and invoices for customers and clients. At Spectrum, we can take care of it all. From printing your custom stationery, shells and letterhead, to printing your customers‘ or employees‘ information on them and getting them to their appropriate locations with our mailing services and custom envelope designs, we are here to help. We’ll even stock your preprinted stationery in our shop so it’s ready for future printing. We can print your full-color custom stationery in large quantities to help save you money, store them until they’re ready for use, imprint in black ink to reflect the appropriate information, and send them to their appropriate destinations with our print-and-store program.